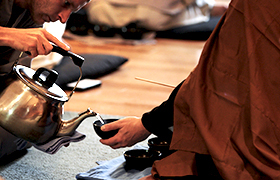 Because sesshin is a very intensive retreat, those wishing to attend should first complete an Introduction to Zen Training Retreat. Those who have never participated in sesshin before or who are newer to Zen practice should plan on beginning with the Thursday-Sunday portion of the retreat. Most sesshins may be joined in progress as late as Friday evening. First-time sesshin participants should call the Training Office to set up a “sesshin interview” as part of the registration process. To register for this retreat, please contact the Training Office at (845) 688-2228.